This thread is simple! Rather than having a million little threads about everything that goes on at Six Flags Kentucky Kingdom (SFKK), this thread is designed to consolidate it all into one user-friendly thread. Feel free to use it to post updates, trip reports, questions, comments, and of course, general discussion. For pictures and videos of the park as well as past updates, see TPR's Park Index Page. September 22rd, 2011 - Deadlines are missed to re-open park in 2012, new target date is 2013. February 20th, 2012 - Could the park be renamed as Bluegrass Boardwalk? February 23rd, 2012 - Bluegrass Boardwalk plan approved, park set to reopen in May 2013! August 15th, 2012 - Ed Hart is back with a new park reopening proposal! June 27th, 2013 - Details for park's biggest expansion in history! November 30th, 2018 - Kentucky Flyer construction updated posted! March 13th, 2019 - New Kentucky Flyer construction photos posted! Splashwater Kingdom is bigger, better and wetter! 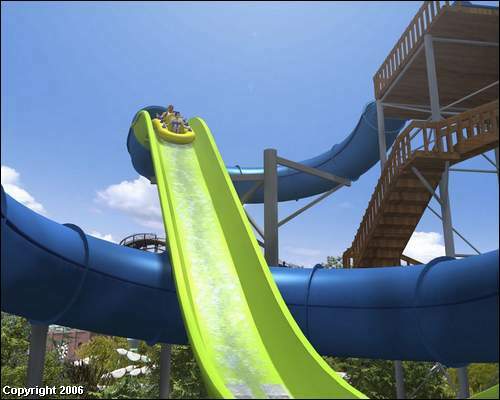 Six Flags Kentucky Kingdom adds the largest waterpark expansion in our history, featuring a new children's play area and state-of-the-art water coaster. Deluge is our new cutting-edge water coaster that uses rocket-propelled water, magnets and gravity to blast riders through high-bank turns, tunnels and hills. It's the world's only 4-person "HydroMagnetic Rocket Booster" rafting ride that can be shared with family and friends. Plummet down roller coaster-like drops, then rocket uphill into an enclosed tunnel while getting sprayed with water from all sides. This water coaster is sure to be a hit among roller coaster fanatics as well as water park guests. umbrellas, exclusive cabanas with misting fans, a new beach shop and Ben and Jerry's ice cream parlor. 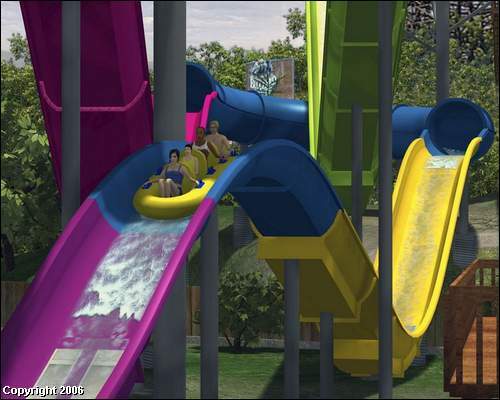 Six Flags Kentucky Kingdom opens April 6th and the newly expanded Splashwater Kingdom debuts May 26th. The waterpark is free with your theme park admission. "Deluge is our new cutting-edge water coaster that uses rocket-propelled water, magnets and gravity to blast riders through high-bank turns, tunnels and hills." "Plummet down roller coaster-like drops, then rocket uphill into an enclosed tunnel while getting sprayed with water from all sides." "This water coaster is sure to be a hit among roller coaster fanatics as well as water park guests." Last edited by robbalvey on Sun Apr 21, 2019 10:06 am. Dayumn, that looks awesome. I guess I'll have to bring my swim wear to SFKK on the mid-west trip just to ride this. It looks like f**king mania! It looks pretty awesome! Definitely a nice addition to a relatively pathetic water park. I've gotta pop the question- Is that a credit? It's somewhat gravity powered and it travels along a track... Never-the-less, it looks completely awesome, and could really draw me into a water park, which I usually skip in favor of theme parks. This looks really cool! But why do they consider this a "water coaster"? Hydromagnetic? How does this thing magnetically launch? LIM launched conveyor belts or do they magically magnetically charge water? I'm hoping the second one because that would be cool. I'd buy Magnet Water. The water coaster term seems to be applied to any water slide that has hills similar to a roller coaster. Example: Halfpipes and Tornados go uphill and defy gravity, but do not 'look' like a roller coaster. These 'water coasters' that have 'bunny hills' on them seem to fit the bill a bit better and are using the term. I've seen Water Coasters with uphill sections with no water power, zip strip, or LIM technology a long time ago...they're just getting more advanced now. Anyway, looks like fun! I've always said I like waterparks as much as amusement parks! 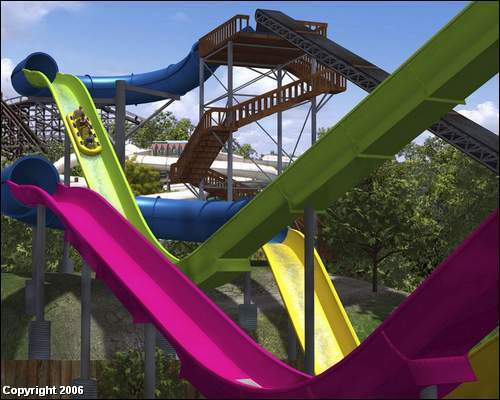 Oh, and I'm pretty sure this is ProSlides new version of their water coaster technology. Looks pretty awesome! Its nice to see other parks get good additions. I will have to get on it whenever I make my trip to Kentucky Kingdom! That looks awesome!Now if only Blizzard Beach would get one of these.